Back in July, we had the opportunity to cover a tremendous story about a man named Albert Manero, who had created a 3D printed myoelectric prosthetic arm for a little boy named Alex. That arm provided Alex with the opportunity, for the first time in his life, to give his mom a full hug. While that story seemed to have a very happy ending, in reality it wasn’t even close to being over with. Although Alex was quite happy with his new arm, and Manero certainly made a huge difference in Alex’s life, his goal of changing the world still is what drives him. Manero has showed this with several other 3D printed prosthetic arms which he has created for more children, though his organization Limbitless Solutions. Manero doesn’t simply sit down and accept what he creates. He is always looking to iterate upon his designs, trying to make the next one even better than the previous. As for Alex, he is a huge fan of Iron Man as well as Robert Downey Jr. who plays the Iron Man character in the popular films. Thanks to Manero, his organization Limbitless Solutions, the volunteer 3D printing prosthetic group e-NABLE, the #CollectiveProject, and none other than Iron Man himself, Robert Downey Jr., little Alex was treated to an extraordinary surprise. As Manero led Alex through the halls of a hotel building and up to a room where Downey was awaiting him, Alex had no idea that he was in for the surprise of a lifetime. As Manero and Alex walked into the room, they were greeted by Robert Downey Jr., who presented to Alex a 3D printed myoelectric arm that looked almost exactly like the arm Downey wears in the Iron Man films. Also on hand was the real Iron Man arm, which Downey put on to compare to Alex’s. Alex’s 3D printed myoelectric Iron Man arm. The incredible looking arm not only looks great but it actually allows Alex to pick things up and take part in other normal task which he found incredibly difficult prior to having a prostheses. “He keeps working and working until he gets it right,” said Alex, referring to Manero. The odds are that this won’t be the last arm that Manero creates for Alex, but it just may be the coolest yet. This goes to show that even Hollywood celebrities have soft spots in their hearts, as Robert Downey Jr. took time out of his busy schedule to help make this boy happy. As for Manero, he is certainly on his way to changing the world, one step at a time. 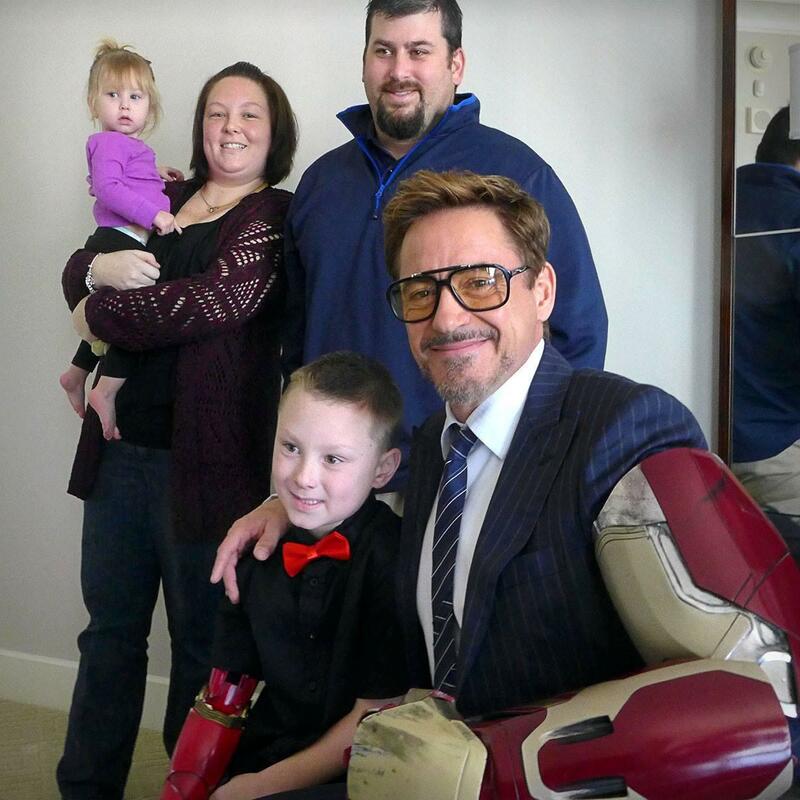 What do you think about this incredible 3D printed Iron Man arm which Manero and Downey presented to 7-year-old Alex? Discuss in the 3D printed Iron Man Arm forum thread on 3DPB.com. Check out the video of Robert Downey Jr. surprising Alex with his new arm below. Tagged with: 3d printed arm • 3d printed iron man arm • 3d printed prostheses • 3d printed prosthetic • albert manero • avengers • Iron Man • iron man prosthetic • robert downey jr.